After finishing this tutorial you'll have a live graph of your RADIUS connections and see which users are having troubles connecting. Before we begin keep in mind that none of the servers or services I'm describing should be available from the internet. This should only be implemented in a LAN environment because the traffic will be unencrypted. Don't install the database or the dashboard on a device that is accessible through the internet. 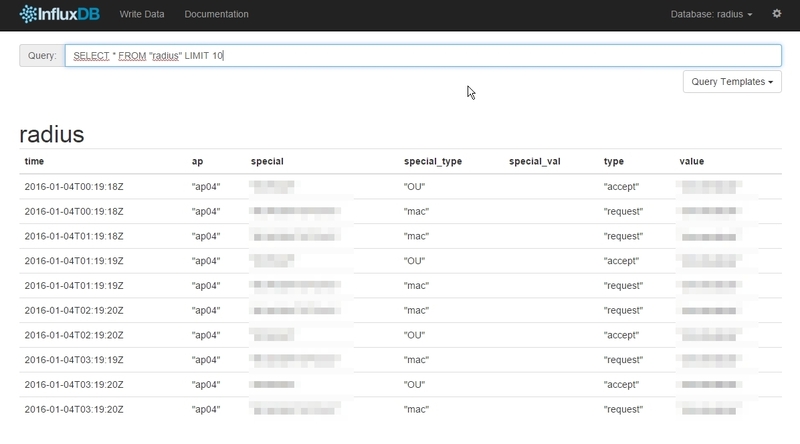 Configure the NPS logging (NPS -> Accounting -> Logging settings) to save in the format ODBC (Legacy) and "Monthly"
InfluxDB is my database of choice since it's built up from the ground as a time based database. That means every entry will automatically have the time as index (primary key). This is where the magic happens. Since we can't change the NPS RADIUS Server to serve to influxDB directly, we'll have to parse the log files. Make sure your logfiles exist at C:\Windows\System32\LogFiles. They should start with "IN" and then year, month and ".log" as extension. eg: C:\Windows\System32\LogFiles\IN1601.log for january 2016. Edit the first lines in the analyze_influx.php file so it points to the right IP of the influxDB server and don't forget to set your timezone. If set to true, you can import old log files. The parser will exit after importing all. If you do this more than once you'll have double entries. Also keep in mind that these log files are around 100MB per month and parsing them might use very much memory on your influxDB box! I imported data from 2011 to 2015 and it used about 16gigs while importing. 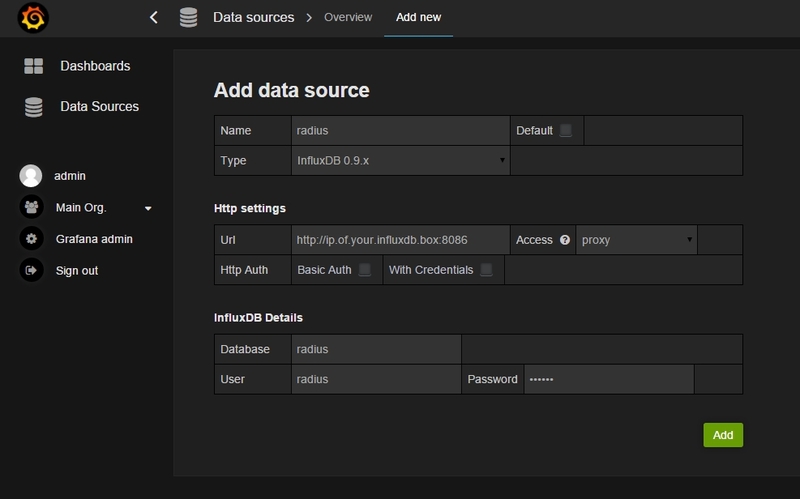 DBNAME, DBIP and DBPORT are the settings on which InfluxDB to connect. These settings should be set acordingly to the /etc/influxdb/influxdb.conf file and point to the IP of the influxDB server. Note: This step could be done from the Windows box too but I like to put Grafana and InfluxDB on the same box so I can work with "localhost" and it doesn't use any more traffic. Then start Grafana service grafana-server start. You should now see your dashboard which automatically updates and displays all connections.